Miss Peregrine’s Home for Peculiar Children is the first novel from travel writer and blogger, Ransom Riggs. The story begins when Jake is eight years old. At this age, he finds the stories his Grandfather, Abraham, recalls of his childhood in a Welsh children’s home hypnotic. Tales of him fleeing monsters in Poland and hiding amongst a group of strange and gifted children. His grandfather shows him photographs of a levitating girl, a boy holding a huge boulder over his head and one of clothes, seemingly filled with an invisible body. But as Jake grows older and is teased for believing in fairies, he starts to see his Grandfathers stories as lies and the photographs as manipulated images. Jake’s father explains that his Jewish grandfather had been sent away from Poland by their family during World War II to escape the Nazi’s and that was where the idea of ‘running from monsters’ must have originated. Jake insists to his grandfather that he is too old for these lies and they are never mentioned again until Jake is 15 years old. By this time Jake’s grandfather has become quite old and everyone is concerned for his sanity as his stories of the monsters chasing him return. One day Jake gets a hysterical called from his grandfather and Jake leaves work early to check that he is ok. When he gets to his home, the place is a mess but he cannot find his grandfather anywhere. When he notices a slice through the backdoor screen, he wonders if it may be animals from the surrounding woods and runs into the forest in search of his grandfather. To his horror, he finds him cut, bloody and dying on the forest floor. The last words he utters haunt him. The words do not haunt him anyway near as much as the sudden glimpse of a hideous black creature amongst the trees. There for a second, then gone. Jake’s parents decide therapy is the best option after hearing his account of Abraham’s death and the monster in the woods. As he pieces together the clues of his grandfather’s last words, Jake realises he has to visit the small Welsh children’s home his grandfather spoke of to truly understand him and hopefully gain some sort of closure. 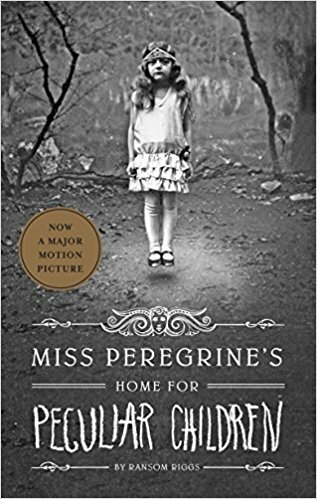 When Jake finds the children’s home abandoned and derelict he is on the verge of giving up on earthing his grandfathers past but soon he discovers the island, the home and the peculiar children in the photographs all have secrets and reasons to hide. From the first time I saw this book come into the store I work in, it caught my eye and went straight on my ‘must read’ list. The cover of a hovering girl and strange images on the back are real attention grabbers. The story itself is told in a beautifully unique mix of both writing and real vintage photographs that have been acquired by collectors over many years. This mix works brilliantly and although I think I would normally prefer being left to my own imagination, the photographs that are chosen work so well that it really adds to the tale. The first half of this novel does have a brilliant creepiness to it that does slow slightly as you are warmed to the children and their individual characters. But then you are quickly whisked up in the threat to them, rather than set by them. Although this book is classed as a horror, at no point was any gore overdone (a real horror pet peeve of mine) and it is the suspense that is created that really makes this a horror. Descriptions of the decrepit old house were real favourites of mine. I hugely enjoyed this book and would highly recommend it to anyone who likes their books a little bit dark, a little bit strange and definitely unusual. So for me, it was perfect! I will definitely be keeping an eye out for anything from Ransom Riggs in the future.